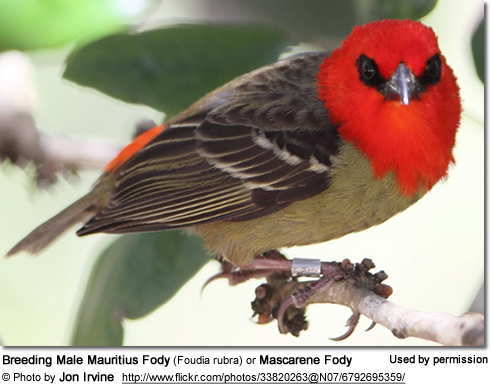 The Mauritius Fodies (Foudia rubra) - also known as Mascarene Fodies - are only found on the island of Mauritius off the southeast coast of Africa, where they inhabit forests and plantations. These rare weavers are in danger of becoming extinct. In 2011, less than 170 individuals were believed to still have survived in the wild. As part of conservation efforts, the Mauritian Wildlife Foundation removed eggs from active nests prompting the parents to get started on a new clutch. Those eggs that were taken were artificially incubated and the resulting chicks were handraised; hence doubling the number of offspring per pair. Thirty-two of these hand-raised birds were then released back into the wild between October 2010 and January 2011. Unfortunately, most or even all of them are believed to have perished. Their sharp declines are attributed to habitat loss and predation by introduced mammals (black rats and macaque monkeys) and the native Round Island Boa (snake). 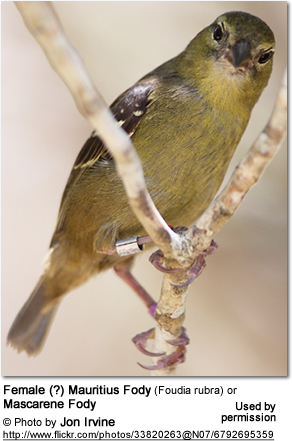 These brightly colored birds are now only found in southwest Mauritius and on the small, offshore island of Ile aux Aigrettes, where captive-bred birds were released in 2003. Breeding males: Plumage olive-brown, except black lores (area between the beak and the eyes); red head, chest and rump patch; two white wingbars; and pale-brown streaked wings and tail. After the breeding season, the male molts into the plainer "winter plumage" (described below). 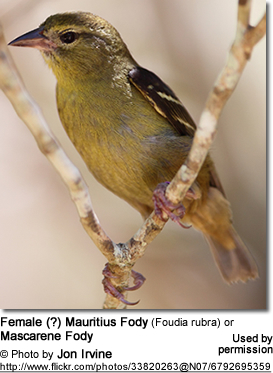 Mauritius Fodies mostly feed on insects; but they will also take fruit, nectar, seeds, geckos and - on occasion - the eggs of other birds (including those of other Mauritius Fodies). 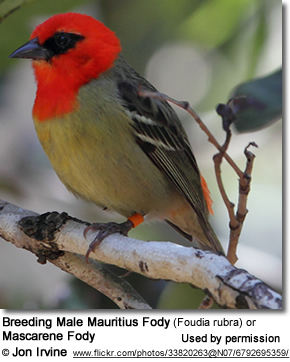 Mauritius Fodies generally form monogamous pair bonds; although males have on occasion been observed with more than one female. Pairs maintain a breeding territory that they defend throughout the year. Most breeding occurs from late June to early April. Both parents weave the nest; but only the female lines it. The average clutch consists of 2 - 4 eggs which are incubated by the female for about two weeks to hatching. The male feeds the female and the young.